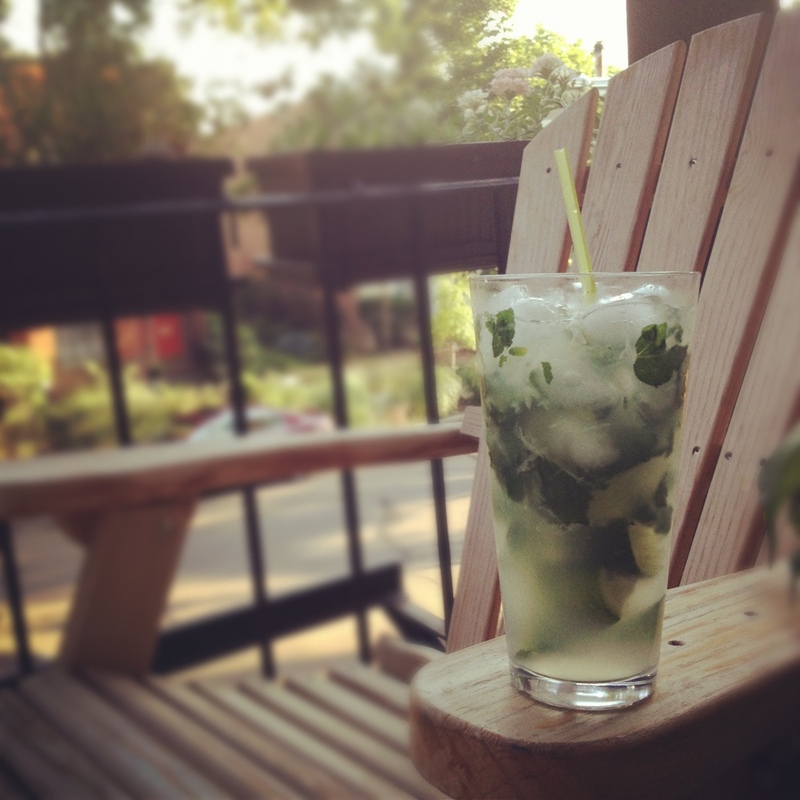 I posted the photo at right – of a delicious mojito I made with mint from my porch garden – on Facebook yesterday, and someone requested the recipe, so I thought I would share it here. It’s pretty simple, and also easy to adjust depending on how sweet and/or strong you like your drinks. I’m not a huge fan of sweet drinks, and I like my drinks big but not especially strong, so that’s the baseline I’m working from. Juice the lime in the bottom of a large glass (I use a 20-ounce). Cut the lime remnants into 4-8 pieces and toss in on top of the juice. Add the simple syrup, rum, and mint. Muddle – that is, smash it all up good – with a wooden spoon. Fill glass with ice, top off with club soda. Give it a thorough stir, and drink up! I’ve seen variations that involve adding strawberries or blueberries, and some that call for Sprite instead of soda water, so it really is quite adaptable. * simple syrup = 1:1 ratio of sugar to water, boiled until the sugar is completely dissolved, and then for another minute or so after that. I usually make one cup water, one cup sugar and stash the rest in the fridge, where it keeps pretty well for future mojito needs. Prettiest drink around – I could look at it all day! But unfortunately, not a fan. What I really wanted to say was that your Dad was a great fan of “muddling” ( ask me sometime 🙂 If you don’t have a muddler, we’d like to gift you with one. Yes, fond memory. And, Jim always patiently explained to many a young food server what “muddling” meant 😊. Not my drink of choice either — too sweet — but I kept the recipe anyway!